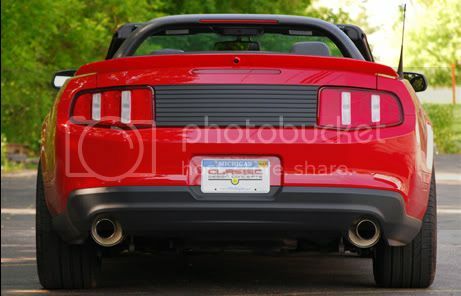 The Mustang Deck Lid Trim Panel is a simple and quick modification that makes a big difference. The rectangular space between the taillights of the 20'11 models lies indented just about an inch. This trim panel fills that gap completely so the deck lid and taillights all work together nicely for a much cleaner look. Regardless of your Mustang's color, the addition of the Deck Lid Trim Panel is sure to get your vehicle much more attention. - Classic Design Concepts ALL NEW Decklid Trim Panel is designed and engineered to the same OE quality standards as is predecessor. - Made of OE Quality Grained RIM Material and fastened with 3M acrylic bonding tape. - Clean, classic and easy to install, you'll find this Decklid Trim Panel among the most cost effective and impressive modifications you'll ever make!